Every year on February 2, people all across North America tune in to see if the famous weather forecasting groundhog will emerge from its burrow, or see its shadow and retreat back underground. Traditionally, if the groundhog sees its shadow, then 6 more weeks of winter will follow. If the groundhog emerges without seeing its shadow, then we will have an early spring. Wiarton Willie failed to see his shadow – so, according to tradition, an early spring is on its way. Shubenacadie Sam from Nova Scotia also said winter is ending soon. Punxsutawney Phil did see his shadow, which means there will be six more weeks of winter. One of the newest features to our site, QuiBids Games, provides bidders with the opportunity to play games and win tons of free bids. One of the more popular games on QuiBids is Groundhog Hunting. 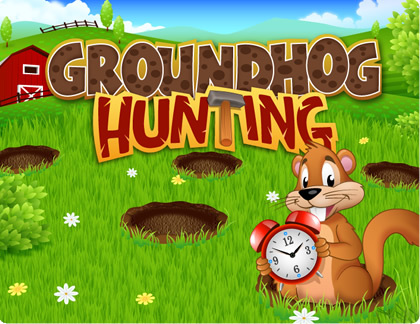 Groundhog Hunting involves whacking as many groundhogs as you can before the timer runs out. This is a humane way to take out your frustrations on these furry weather forecasters from the comfort and safety of your computer; plus you can get FREE bids! Do you think groundhogs are more for “weather” or “whacking?” Leave a comment and let us know! QuiBids’ Games in Every Country!